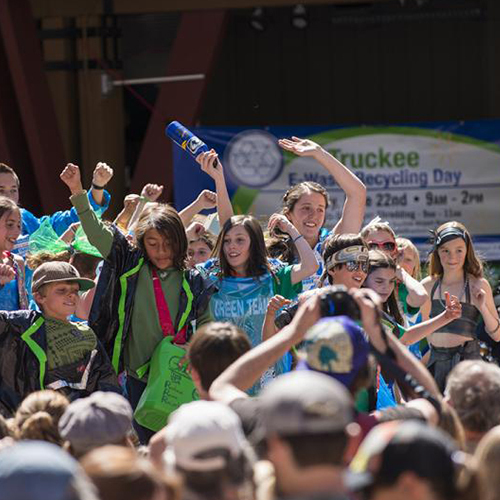 The The 2019 Tahoe Truckee Earth Day Festival returns to the Village at Squaw Valley on Saturday, April 20. One of the largest Earth Day celebrations in the area, the free community event takes place at the Village at Squaw Valley from 11 a.m. to 5 p.m., and gives kids and adults the opportunity to learn about recycling, composting, alternative energy, and sustainability through hands-on activities the whole family can enjoy. At a diverse array of earth-friendly educational booths displayed throughout the day, participants can get dirty in the compost zone, explore new ways to recycle, learn about solar energy, and check out children’s activities and brain teasers hosted by The Discovery. We are now accepting applications. Please follow this link. The event also boasts live music from Serina Dawn Band and Coburn Station, a dance presentation by the Reno World Dancers and Sierra Watershed Education Partners (SWEP) and Tahoe’s very own Envirolution Trashion Show. The Tahoe Truckee Earth Day Festival is free to the public and T.A.R.T. will be offering free return bus services from the festival to North Lake Tahoe, Incline Village and Truckee. The Tahoe Truckee Earth Day Festival is a zero waste event. Food and biodegradable waste will be collected by volunteers and Incline Village General Improvement District (IVGID) Waste Not to be composted. In addition, all food vendors will utilize biodegradable take-out containers when possible.